Years of the Rat. 1924 – 1936 – 1948 – 1960 – 1972 – 1984 – 1996 – 2008. Rats are both charming and aggressive. They appear calm and well balanced on the surface, but underneath, they are restless and a little nervous. 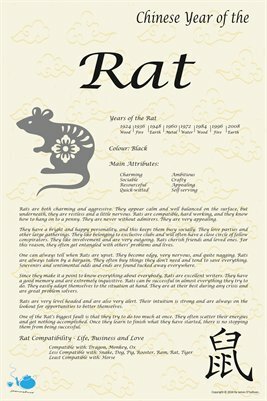 Rats are compatible, hard working, and they know how to hang on to a penny. They are never without admirers. They are very appealing. They have a bright and happy personality, and this keeps them busy socially. They love parties and other large gatherings. They like belonging to exclusive clubs and will often have a close circle of fellow conspirators. They like involvement and are very outgoing. Rats cherish friends and loved ones. For this reason, they often get entangled with others’ problems and lives. One can always tell when Rats are upset. They become edgy, very nervous, and quite nagging. Rats are always taken by a bargain. They often buy things they don’t need and tend to save everything. Souvenirs and sentimental odds and ends are found tucked away everywhere. 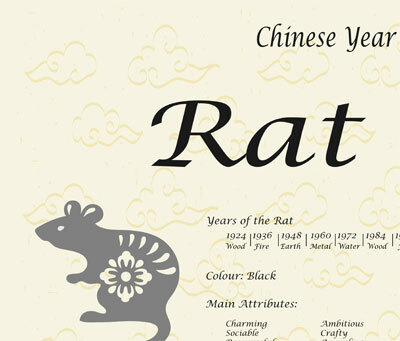 Since they make it a point to know everything about everybody, Rats are excellent writers. They have a good memory and are extremely inquisitive. 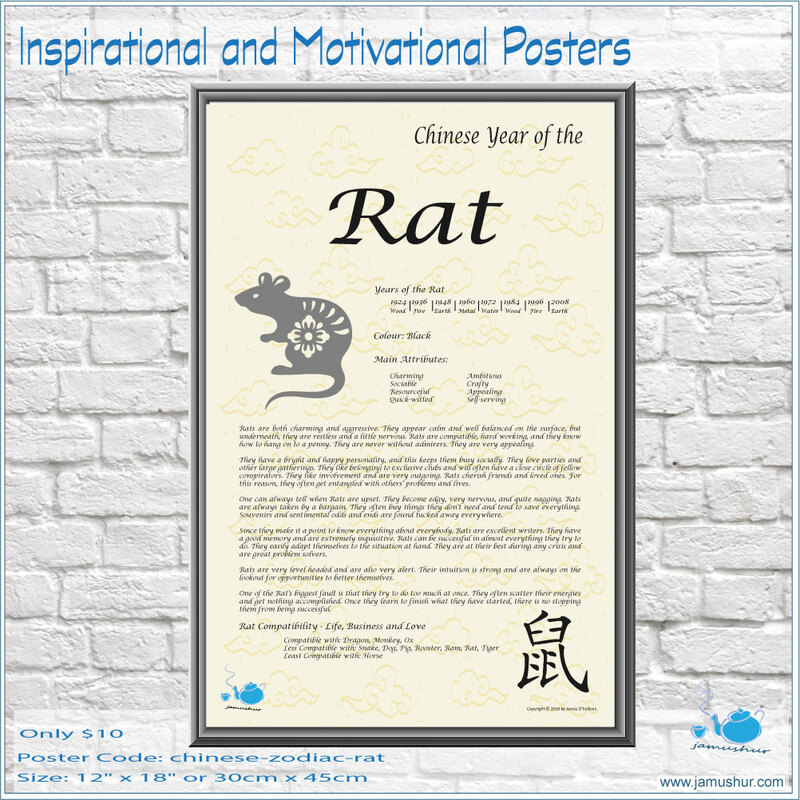 Rats can be successful in almost everything they try to do. They easily adapt themselves to the situation at hand. They are at their best during any crisis and are great problem solvers. Rats are very level headed and are also very alert. Their intuition is strong and are always on the lookout for opportunities to better themselves. One of the Rat’s biggest fault is that they try to do too much at once. They often scatter their energies and get nothing accomplished. Once they learn to finish what they have started, there is no stopping them from being successful.